Our Week Thus Far in Pictures! Cooper and I have had a fun week thus far. We have had some sunshine intermingled with our chilly temperatures, which gave us the chance to get outside yesterday to take some pictures of the pretty fall colors around the neighborhood! Today, we baked a fun cake and Cooper got a hold of the camera. Here’s a taste of our days yesterday and today. Check out the Flickr site for the full gammet-including all of Coop’s random pictures. This weekend was good times here in the Nevil’s O.K. Corral! 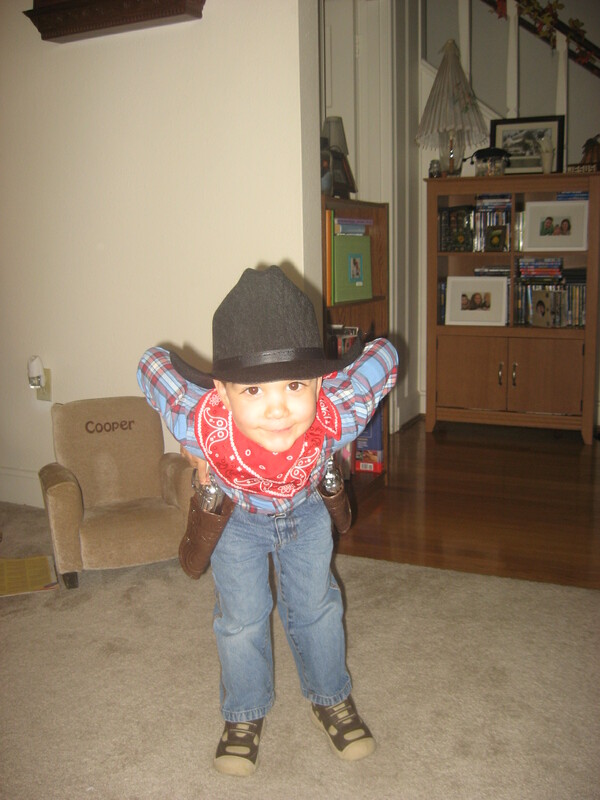 Cooper is going to be a cowboy for Halloween this year and we had a chance to “practice” on Saturday night when our friends, Heath and Adeliz, threw a kick’in costume party. 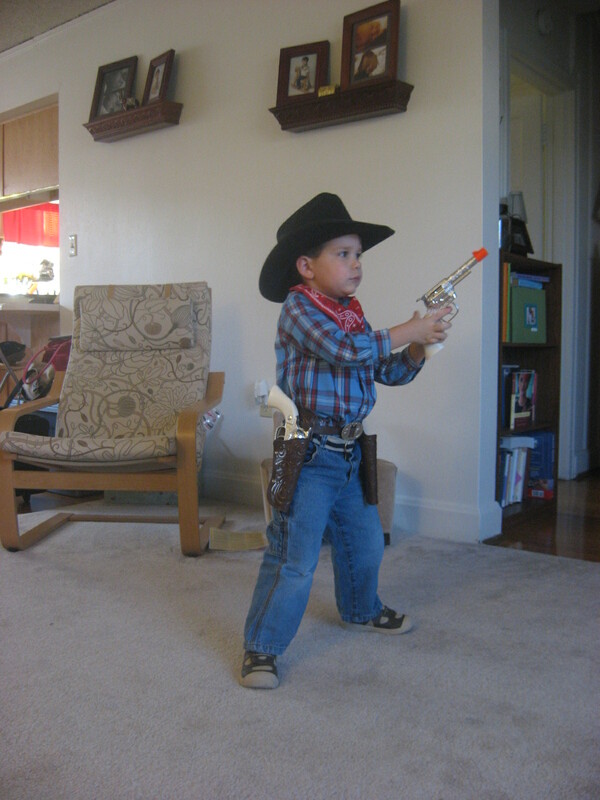 For this costume, we were on the lookout for a cowboy hat, some guns (complete with holsters) and maybe some boots. I never made it to Good Will to check for boots (maybe this week we’ll make a stop), but we DID purchase the hat, guns and holster at Wally World last week. 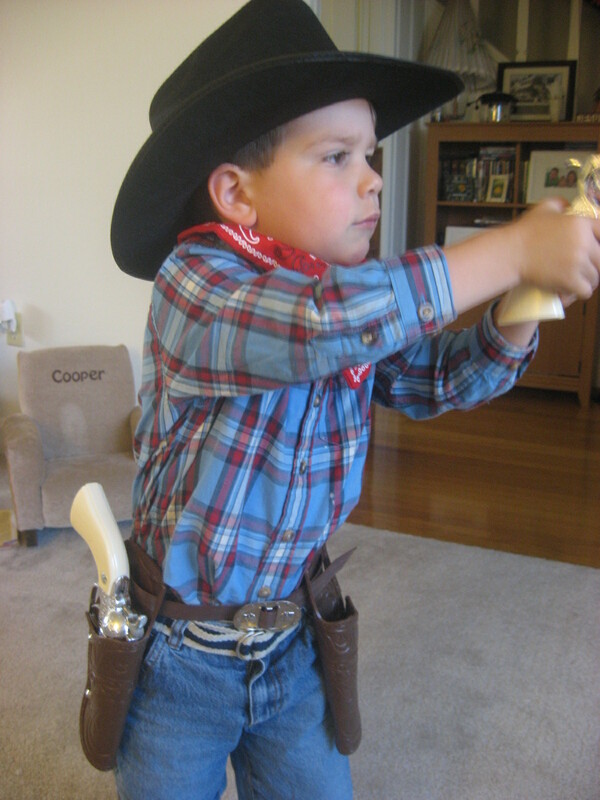 It was great fun to purchase Cooper’s first set of real cap guns. We didn’t buy the caps (stocking stuffer! ), but he can’t really pull the trigger yet anyway. He’s very serious about his costume. This is no joking matter…he he he. 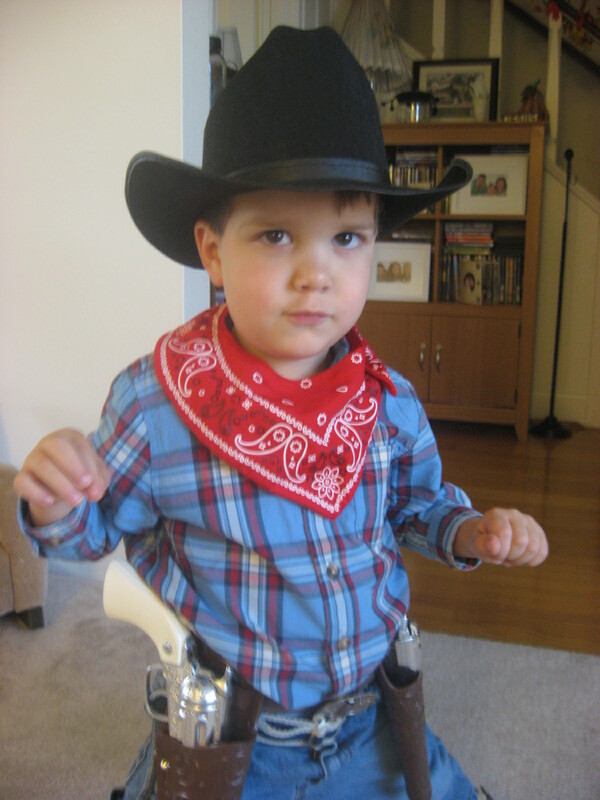 We even taught him to say “howdy partner”. I think this week I’ll need to teach him some more vocab; cow polk, side-winder, etc. Jeremy and I were kind of at a loss for the party. 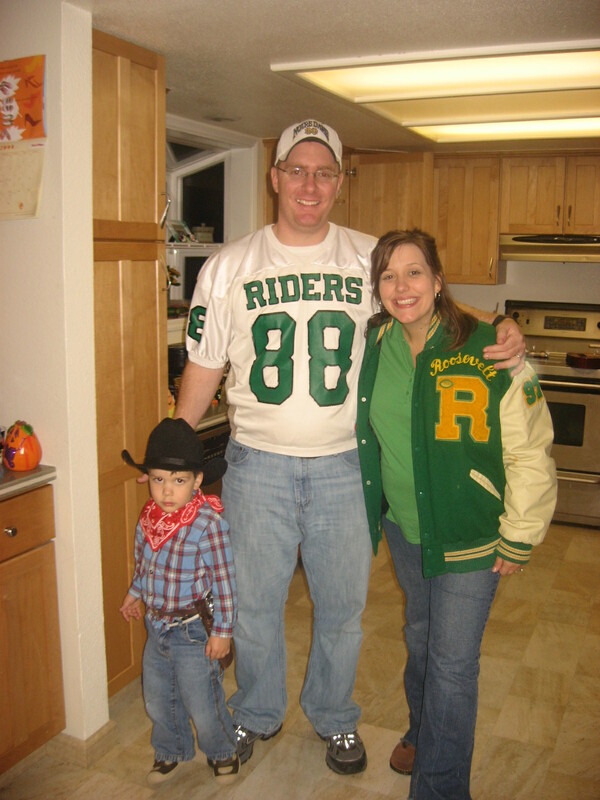 Mostly because I’m pregnant…and that limits (or at least it did in my mind) the costume choices. So we decided to be a highschool couple; the quarter back and his knocked-up girlfriend. I wore Jeremy’s letterman jacket and he wore his highschool football jersey. I guess we could’ve tried to be Angelina Jolie and Brad Pitt…but we don’t have enough kids or diversity. It was fun to see the other families and their creativity, I was really impressed. The Johnson Family came as a Garden (they were a gnome, butterfly, caterpillar, bumble bee, gardener and a flower) and the Wright Family was a Zoo (they were a monkey, a leopard, a skunk, a penguin, a giraffe, and I can’t remember what Adam was!). This is creative stuff guys; kudos to your thoughtful little minds! Also this weekend, Crystal and I went to the Tacoma Holiday Food and Gifts show…which is PC for Christmas Bazaar. It was fun times! They had a bunch of stuff, almost anything you could think of was there. We went last year too, so it was fun to see the same vendors back again (in the EXACT same spot they were last year) with all new stuff. 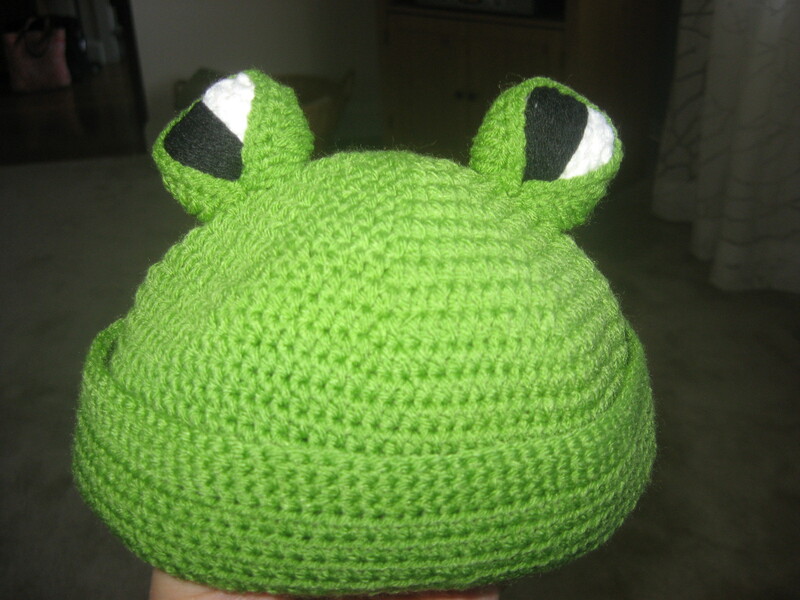 The one thing I bought – I didn’t see much that I just HAD to have – was this super cute hat for Chase. This gal makes all kinds of hats and they had a lot more that were for girls. It was a frog or a bear/monkey for boys. Too cute right? It’s one of the first purchases I’ve made for the little guy! So fun! Anyway, here are a couple more pics of Cooper in his costume just because he’s so stinkin’ cute.